Entities often make payments to their customers for a variety of reasons. Often these payments relate to the sales transaction from an entity to the customer. In other cases, the entity may purchase goods or services from one of its customers. Examples of payments to customers include slotting fees, cooperative advertising, buydowns, price protection, coupons, rebates, and others. The main issue in accounting for these payments is whether the payment should be accounted for as a reduction of revenue or as a regular purchase from a vendor (normally an expense). This analysis should be made during the “determine the transaction price” step of the new five-step process under ASC 606. Guidance on this subject can be found in ASC 606-10-32 paragraphs 32-25 through 32-27, and details the following questions that an entity should consider to properly account for consideration payable to a customer. Does the payment fall into the scope of this guidance? Does the entity receive a distinct good or service in exchange for the consideration payable? Can the fair value of the distinct good or service be determined? Is the consideration payable higher than the fair value? First, for a payment to fall into the scope of this guidance, the payment must be to parties that directly purchase the entity’s products or other parties within the distribution chain that purchase the entity’s products later on. For example, a retail partner and the end consumer would both be considered a manufacturer’s customer. 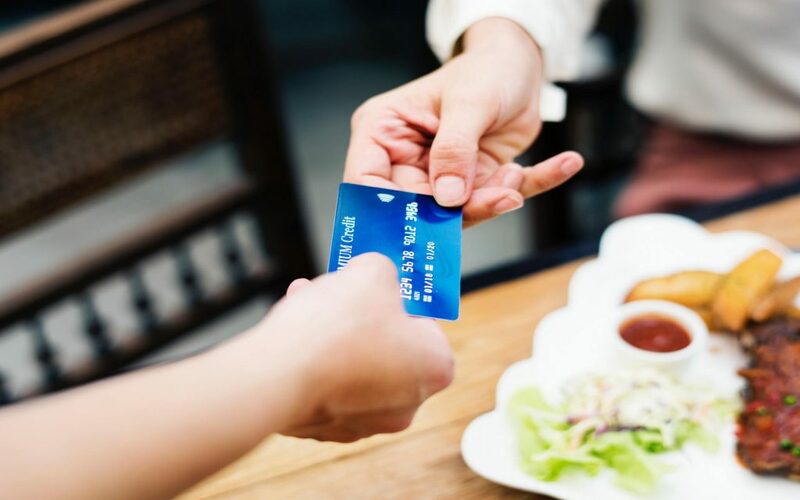 The term “payment” includes equity instruments and credits or other items that can be used by the customer to offset the amount owed to the entity, in addition to cash consideration. Second, the company must determine whether or not a distinct good or service is purchased from the customer. If the entity does not receive a distinct good or service, the amount payable to the customer should be a reduction of the transaction price of the related revenue contract. Companies should consider whether the same benefit could have been acquired from a party that does not purchase the company’s goods or services. For example, assume an entity gives its retail partner a discount if the retail partner provides space for the entity’s goods on its shelves . This service is of no value to the entity if the retailer is not selling the entity’s goods. Thus, the entity should conclude that it is not receiving a distinct service and should account for the payment to the customer as a reduction of the transaction price. Third, if it is determined that a distinct good or service is being transferred, the entity must be able to reasonably estimate the fair value of that good or service in order for the consideration payable to be ignored as a reduction of the sales price. Fourth, if the fair value can be reasonably estimated, the amount of consideration that can be accounted for as a normal purchase from a supplier is limited to the fair value of the distinct goods or services that were received. Any excess consideration payable over the fair value of the distinct goods or services received should be accounted for as a reduction of the transaction price. If the fair value cannot be reasonably estimated, the entire consideration payable results in a reduction of the transaction price. 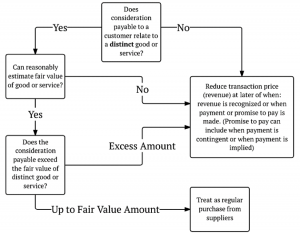 The following figure illustrates the process an entity should go through to account for consideration payable to a customer. A consumer goods manufacturer enters into a one-year contract to sell goods to a large retail company. The customer commits to buy at least $250,000 of products during the year. The contract also requires the entity to make a nonrefundable payment of $25,000 to the customer at the inception of the contract. The $25,000 payment will compensate the customer for the changes it needs to make to its shelving to accommodate the entity’s products. The Financial Accounting Standards Board (FASB) Transition Resource Group (TRG) has met and discussed the following issues. Issue 1: Are entities required to apply the guidance on consideration payable to a customer at the contract level or more broadly to the entire “customer relationship”? Issue 2: The guidance refers to payments made to a customer or “to other parties that purchase the entity’s goods or service from the customer.” Is this guidance meant to apply only to customers in the distribution chain or more broadly to any customer of an entity’s customer? Issue 3: What is the appropriate timing for recognizing consideration payable to a customer that is anticipated, but not yet promised, to the customer? View A. 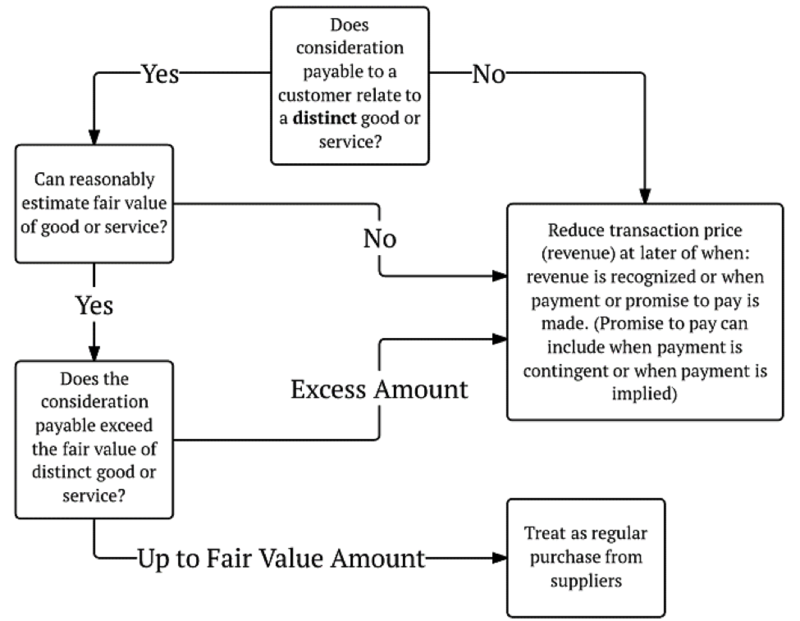 Entities must evaluate all consideration paid or payable to a customer (across the entire relationship) and assess whether such amounts are paid for a distinct good or service, and if so, whether the amounts exceed the fair value of that good or service. While evaluating all consideration paid to customers would potentially be time consuming and costly, this would improve the entity’s chances of accounting for all transactions appropriately. Members of the TRG noted that this approach seems to be best supported by the revenue standard. Regardless of whether View A or View B is taken, the accounting conclusion for each transaction would rarely change because any amount payable to a customer that is not in exchange for a distinct good or service would generally be dependent on another contract with that customer. View B. Entities are only required to apply the guidance to amounts paid within the same contract or contracts that must be combined pursuant to the guidance on combination of contracts (See TRG memo 37-7). Transactions that are clearly not related to revenue-generating contracts would not need to be considered. Some members of the TRG agreed that this approach seemed to make more sense, but as previously stated, the entity would likely arrive at the same result no matter which approach is taken. Others expressed concern that a strict application of this approach may fail to identify certain linked transactions if the relevant agreements are not entered at or near the same time. This method improves efficiency but would make it easier for an entity to overlook a contract that should be accounted for as a reduction of revenue. However, with a reasonable application of the modification guidance should identify such contracts as economically linked. View A. The guidance refers explicitly to “parties that purchase the entity’s goods or services from the customer” and therefore, only applies to entities in the distribution chain. Under this view, a payment to a party not in the distribution chain is not within the scope and should be recognized as an expense. This is similar to current U.S. Generally Accepted Accounting Principles (GAAP). In addition, ASC 606-10-32-25 explicitly refers to customers in the distribution chain. Those with this view argue that if a payment is made to a customer of a customer who is not in the distribution chain, and it is explicitly or implicitly included in the contract with the customer, then the payment represents a marketing expense similar to payments made to other parties to increase sales. View B. The guidance should be applied more broadly to any customer of an entity’s customers, including a “customer’s customer” that is not purchasing the entity’s goods or services (that is, a party that is not in the distribution chain). In ASC 606 paragraph BC92, the Basis for Conclusions (BC) refers to a promise to a “customer’s customer” and does not limit that to parties within the distribution chain. Supporters of this view suggest that it is unlikely that an entity would make payments to a third party that does not purchase the entity’s goods or services unless that payment is related to a contract with a party that does purchase the entity’s goods or services. Furthermore, proponents of this view raise the concern that under View A, principal-agent transactions could result in disparate accounting treatment. For example, an agent generally considers the principal its customer, but may or may not consider its principal’s customer to be its own customer. This approach would prevent such a discrepancy by requiring an entity to consider payments to a customer’s customer (in addition to parties within the distribution chain). In their March 30, 2015 meeting most members of the Transition Resource Group generally agreed that View A is the best interpretation of the guidance. However, they also noted that in narrow circumstances, such as this principal-agent issue, View B should also be considered. There appears to be inconsistency within the standard about the timing of recognizing consideration payable to a customer. The variable consideration guidance, which lists consideration payable to a customer as a key component of variable consideration, requires an entity to estimate total revenue at the inception of the contract. However, in the guidance specific to consideration payable to a customer, entities are required to recognize the reduction of revenue at the later of when the related revenue is recognized or when the entity pays or promises to pay the consideration. The following example was given in the TRG memo to illustrate the issue. “An entity that manufactures consumer goods enters into a contract to sell a new product to a customer (a retail store chain) on December 15th. Before delivering any of the new products to the retail store chain, the entity’s marketing department assesses whether the entity should offer CU1-off coupons in newspapers to encourage consumers to buy the new product. The entity will reimburse the retail store chain for any coupons that are redeemed. The entity has not historically entered into similar coupon offerings in the past. Following the variable consideration guidance, the entity would reverse the revenue as soon as the amount it expects to receive changes, which would be December 31 in this example. However, the consideration payable guidance states that the entity would recognize the reduction of revenue at the date the offer is communicated which would be January 2. The assumption in this example is that the entity does not have a history of providing this sort of offer. If there were historical precedent, that offer would likely have been implied from the beginning of the contract, in which case the reduction of the transaction price should have happened at inception. The FASB staff concluded that the entity should reverse the revenue in this case at the earlier of when the transaction price changes (when the amount the entity expects to receive changes) or when the consideration payable to a customer is promised. This conclusion seems to be in line with the purpose of constraining variable consideration, for which the reversals of revenue should happen as little as possible and as early as possible. Accounting for consideration payable to a customer under the new standard is similar to the accounting under current guidance (ASC 605) with two significant differences. First, under current guidance, these payments are presumed to be a reduction of revenue unless that presumption can be overcome. The new standard requires an entity to determine from the beginning whether or not a distinct good or service is received; there is no underlying presumption that the payment should be classified as one or the other. Second, a reduction of revenue may be recognized earlier in certain cases under the new standard because of the variable consideration guidance. If a company has not officially extended an offer but expects to, the reduction of the transaction price under the new standard would happen before revenue is reduced under current guidance (when the offer is officially extended or the related revenue recognized). One issue that may have significant diversity in practice, and is a potential change from 605, is the timing of the recognition of the reduction in the transaction price (either following variable consideration guidance or at the later of the recognition of the related revenue or when the offer is made). The issues regarding which amounts payable to analyze (Issues 1 and 2) should not affect the ultimate revenue recognition conclusion that companies reach. Companies that will likely be affected by this guidance are those that sell their products into a distribution channel and have flexible relationships with those channel members. ASU 2014-09: “Basis for Conclusions.” BC 255-258. FASB & IASB, TRG Memo 19: “Consideration Payable to a Customer.” 26 January 2014.